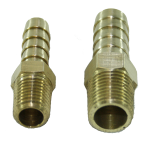 Hose barb kits contain a straight brass hose barb which can be threaded into any number of pick-up points in the water pump, gear cooler or heat exchanger. These hose barbs are sized to match the corresponding fitting on each SureSeal. The kit includes 8' of marine grade silicone fuel hose and all necessary hose clamps. Please note that the use of hose barbs in the raw water cooling system requires good care during installation and additional maintenance once installed. Some pick-up points may be dry locations. Check for adequate water flow (1 gallon per minute) before operating the vessel. Some pick-up points may require the use of 90° elbow fittings rather than the straight hose barbs provided by Tides. This type of 90° fitting should be avoided if at all possible. Sediment, engine scale, rust and other debris are prone to collect in such 90° turns. Manifold pick-up points must be inspected several times a year for debris mentioned above. These manifold areas are usually used as drain points. As a result, they can collect enough debris to impede water flow in a short period of time. Pick-up points at the bottoms of elbows (again, normally used to drain the system) may fill with sand and other materials if the vessel operates in shallow water (or runs aground). Inspect these pick-up points regularly. Water pick-up hose should be routed from the pick-up point on the engine to the SureSeal® in a manner which eliminates / minimizes the possibility of chafing, burning or kinking. Turns made by the hose should be minimized to improve water flow. Support clips / clamps / ties used to dress the hose should not be so tight as to crush the hose / restrict water flow. Tides also recommends that a bit of slack be left in the hose near the SureSeal® to allow for some movement. This will minimize loading of the SureSeal® on the shaft during normal vessel operation.